Located in one of the prettiest villages in Ireland, is the Dunraven Arms Hotel. One of Ireland’s premier . . . Located in one of the prettiest villages in Ireland, is the Dunraven Arms Hotel. One of Ireland’s premier hotels, restored and renovated, but carefully in keeping with the old-style village, which is something of a visitor’s attraction in itself. The Dunraven Arms welcomes its guests not only to the spacious and tastefully refurbished bedrooms, but also to the highly rated award-winning Maigue Restaurant offering exceptional quality cuisine and a very good cellar. The hotel also features a newly opened leisure center with a 17m swimming pool, therapy clinic, steam room and computerized gym studio. The river, which flows through the village of Adare, affords good salmon and trout fishing. 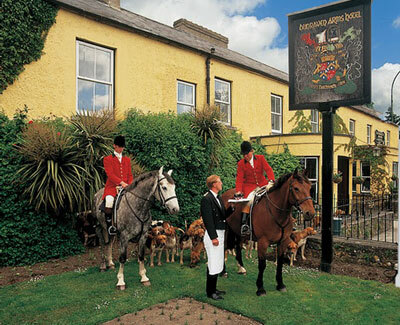 For equestrian enthusiasts, the Dunraven Arms caters famously for riding and fox hunting. For golfers, there’s the beautiful 18-hole Adare Golf Course and Golf Club. With plenty of activities available to participate in and the relaxing atmosphere and impeccable service the Dunraven Arms Hotel supplies, your vacation is sure to be a perfect one.